This article is not about personal use of helmets, it’s about public policy and what governments and other state bodies focus on and spend money on. If you want to wear a helmet or get your child to wear one, please do so. Public policy, however, should be based on facts. 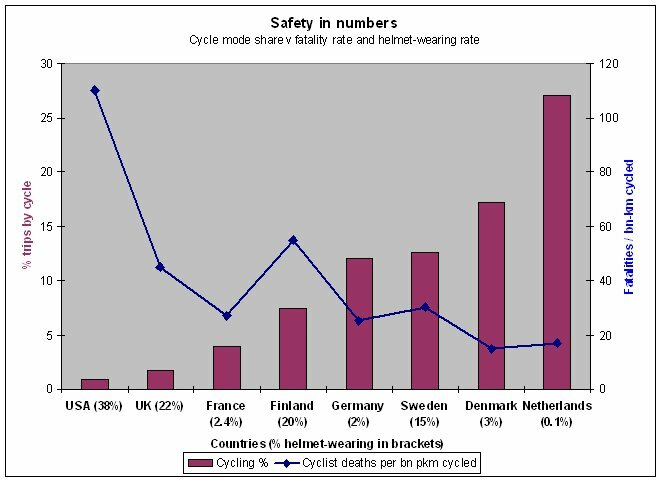 As the above graph from cyclehelmets.org shows, if we’re really worryed about decreasing the amount of cycling-related deaths, helmets arent a good place to look. The Netherlands have the lowest level of helmet wearing and a very high level of cycling, but a low level of deaths per km traveled by bicycle. The response to this is usually something along the lines of “but we don’t have their segregated cycle paths”… sure, but helmet policies have not been successful so-far, so maybe it’s time to start to copy the Netherlands and build more segregated cycle routes of their standards? Public policy should take emotions into account, but, at the end of the day, it needs to follow what’s proven to be effective — the research behind helmets is often problematic and sometimes contradictory, while effectiveness of Dutch-like street and road design is proven at a population-level. From articles to comment sections to Facebook, you’ll find loads of stories that “a helmet saved my life“, but maybe more worrying are the claims that the helmet was so good it stopped all injury. The problem is that we have come across more than a few examples of where people were challenged in close-knit communities, where their peers advised them to seek medical attention, and where they reported back that they had a concussion without knowing it. At a very basic level: The outside shell of a helmet can’t stop the brain bouncing or stretching around inside a person’s skull after an impact. Mandatory helmets law in Australia are linked with a fall in the numbers of people cycling and this effect is proven because it happened first in Australian states which first introduce local helmet laws and followed country-wide when the law was expanded. But beyond mandtory laws, there’s also some signs — even if only tentative — that promotion without a law can slow or even decrease the numbers of people cycling. Strong helmet promotion by Denmark authorities was claimed to be the reason why the percentage of Copenhagen residents who cycle fell from 37% to 35% between 2008 and 2010. While it is tentative in one respect, it is well known that that many teenagers, particularly teenage girls, have issues with wearing helmets. This is shown across countries and forms part of official feedback to Irish smarter travel programmes which look at getting more people walking and cycling. It is not unreasonable to believe this effect goes beyond teenagers (for example, there’s many stories online of non-cycling partners getting their partners to wear helmets). But is it all fashion and convenience above safety? Not when the effectiveness of helmets is so questionable. There’s also UK research showing drivers passing cyclists do so closer when the cyclist is wearing a helmet, although this is disputed by pro-helmet researchers. And there’s what’s called “risk compensation”, or as one study put it: “increased cycling speed and decreased risk perception in a helmet-on compared to a helmet-off condition among cyclists used to wearing helmets.” This, like much of helmet research on both sides, is also disputed. The problems with pro-helmet research are numerous — including low sample sizes, not taking population growth into account, and publication bias and time-trend bias — but possibly the largest problem with the research is bunching all sorts cycling and conditions together. Cycling in fast traffic isn’t the same as cycling with limited or no traffic and downhill mountain biking isn’t the same as cycling to the shop… so how these be comparable at all? That’s not something a larger percentage of pro-cycling research can overcome. “I understand why people wish to use them. But these actions seek to deal with an effect. I want to focus the debate on the cause and campaign for things that will really make cycling safe. That is why I won’t promote high vis and helmets; I won’t let the debate be drawn onto a topic that isn’t even in the top 10 things that will really keep people who want to cycle safe,” said Boardman. But this is exactly the sort of low cost, quick fix that [non-cycling] decision makers dream of! How could we possibly deny them this opportunity? Your first point is invalid because of the many significant confounding factors. point 5 (and point3) is invalid because there’s too many issues with helmet wearing research in general, that bath study is almost anecdotal. @Other Paul: What are these many significant confounding factors? Do you even have a sample of the main ones? What exactly is wrong with point 5? And what exactly is wrong with point 3? And that still leaves us with three other points. I suppose International Professional Cycling organisations have it totally wrong insisting on the professionals wearing helmets. I was hit by a pedestrian last year went over on my back and my head impacted the ground. It was quite a thud. I am absolutely sure there would have been cranial damage if I hadn’t been wearing a helmet. Whilst it might not absolutely prevent concussion, a helmet will stop greater injury due to impact. If compulsory helmet wearing stops a person getting on a bike, I would question whether that person is motivated to ride safely in the first place, which should be the priority of all cyclists. Good thing then they stay off the road. The first reason as someone has already stated is not statistically relevant as there are too many variables to take into account. @Agoodbottleofplonk! — international professional cycling organisations are as relevant to sporting cycling as international professional motoring organisations are to people who drive to work. Re: “if I hadn’t been wearing a helmet” — did you miss the “a helmet saved my life“ bit in the article? 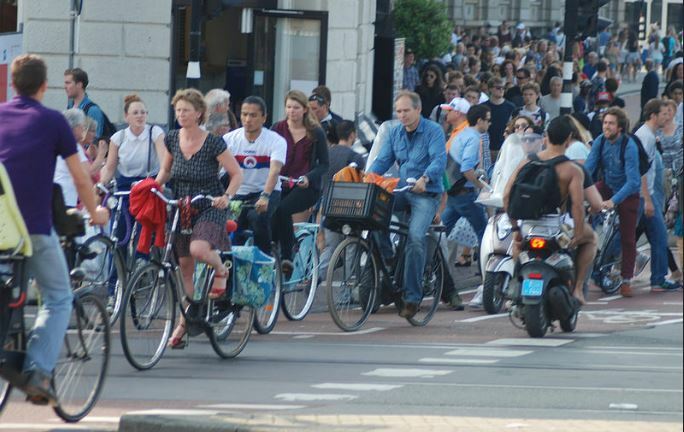 Re: “Good thing then they stay off the road” — The Dutch don’t think so. There’s between 10-16 million people in the Netherlands who are regularly on bicycles and the helmet wearing rate is less than 1%…. how many million trips a year do you think would be worth it in terms on lower health benefits, higher congestion, higher impacts on the environment etc? Re: “The first reason as someone has already stated” … maybe you noticed the Other Paul has yet to answer what the many significant confounding factors are? Maybe you could say what the many variables are? What utter tosh. I’d better get onto the Dutch embassy and let them know millions of their cycling citizens are intent on cycling dangerously. Even aside from Dutch people, your inference is a total load of utter horse-dung. People who don’t want to wear plastic bike hats are intent on riding dangerously!? Whaaa…? Why the flying F*ck would anyone want to actively endanger themselves when they get on a bike!? I cycle for a couple of hours every single day, to commute back and forth to work. I never wear a plastic bike hat. Why? Because cycling isn’t dangerous. And I’ve also no inclination to cycle in a dangerous manner. What an asinine conclusion on your part. I’ve also lived in NZ which does have a compulsory plastic bike hat law, and I HATED having to put that useless piece of plastic crap on my head every time I wanted to go somewhere. When I left NZ to go and live in NL, I happily I threw that piece of plastic crud in the bin. About those International Professional Cycling organisations – I assume this means the UCI and its members, who regulate sports cycling. Even ignoring whether cycle-sport has anything much to do with everyday cycling, look at how they forced cycling helmets onto top-level racing: not based on solid research evidence or anything like that, but by piggy-backing the rule introduction on the tragic deaths of two racers in particular, in racing crashes that there’s very little public documentation about – which might be understandable, to spare the families from distress, but this is something that has been used to require helmet use by many thousands of people since, so there’s a public interest question of whether helmets would have made a difference to them and whether subsequent racers have actually been injured by helmets directly or indirectly. Anyway, racers still die from head injuries, at what seems like a similar rate, albeit a low rate in a relatively small population, so change would be hard to spot – this is sometimes known as the Saving The Unicorn problem – unicorns don’t exist in enough numbers to measure, so would do you know whether rules to save them are working? It seems surprising that the UCI doesn’t appear to be publishing any research about the effects of its helmet rule on cycle-sport. I wonder whether the sponsorship by various helmet sellers from POC to Lidl has anything to do with that. But fundamentally, cycle-sport is very different to everyday cycling, so all this is of very limited interest. With all due respect, sporting cyclists should be banned from wearing helmets, it’s pretty clear that the risk taking in competitive cycling or those riding for cycle sport (sportives/club cycling et al) are ALL taking far far greater risks now than before helmets became a thing. I’ve seen this in action time and time and time again. You only need watch the pro ranks have crash after crash after crash and even the amount of deaths are greater in the helmet years since compulsion compared to the same period previous. Also children are greatly affected by risk compensation but are still at very much low level risk for head injury sans helmet compared to other aspects in life. UK had 6 child cycling deaths (non provable to be prevented by helmet even IF they were wearing anyway because helmets simply can’t prevent death) and yet we had over 300 head injury only child deaths in the same year, a significant portion of which are in the home, out at play and importantly in motorvehicles. the damage done to people on bikes (& society as a whole) by helmets is massive and not in a good way, next to the motorvehicle itself it is the second biggest safety issue. As per the article, it detracts away from the real issues that will actually prevent death and serious injury, it criminally puts the onus on people doing no harm to defend themselves against massive kinetic forces (that helmets simply cannot protect against anyway) and absolves/deflects away from the criminals their actions. it helps police, government even other people on bikes to point the finger of blame at victims for their demise (you only have to look at the recent Michael Mason case and the disgusting met police ‘investigation’ to see a prime example of victim blaming). Even with all that in mind that we see greater head injury rates elsewhere in activities (walking/pedestrians) and that the root cause of the largest proportion of head injuries are in motorvehicles despite airbags, crumple zones, ABS/powersteering/fat tyres, seatbelts/antiskid and computers to avoid all these incidents, so surely by definition if you wear a helmet cycling and promote their use you must use it elsewhere otherwise you are a rank hypocrite with double standards. As I mentioned on an Australian thread, 280 drownings in 2016 (around5 times the number of all cycling deaths which aren’t head injury only as we know), there should be compulsary life preserver wearing for the bath, swimming pools, canals, swimming in the sea etc. there is simply no logic behind helmet laws and even individual choice makes you subject to a higher risk factor because of all the reasons stated and proven. I’d, ride a bike if i didn’t have to wear a helmet. Not because i want to ride dangerously but beacause i hate the feel on my head & love the feel of air through my hair when riding. The fact that injuries went down is because less people ride in Australia. Further Dr Charles Tator is a leading Canadian Neurosurgeon and Professor of Neurosurgery at the University of Toronto, this is what he has to say about the ability of these styrofoam hats to prevent brain injury, https://www.cbc.ca/news/health/bike-helmets-should-address-concussion-risk-scientists-say-1.1367454. If you want to understand brain injury WRT typical bicycling injuries an excellent source is William Curnow’s BICYCLE HELMETS: A SCIENTIFIC EVALUATION ISBN: 978-1-60456-288-0. The facts do not support the notion that styrofoam bike hats increase safety at all. While I think helmet usage is a good thing and I always wear one when on a workout or mountain ride. I dont feel it should be required if I want to run to the store on a old slow bike. There has been many times when i have hit my helmet low tree limbs and a few times on the ground. I will always wear a helmet while mountain biking. If big government want to recommend we wear helmets all the time I am ok with that but to pass a law and take away ones choice is wrong. Some years ago I met a road science engineer from the Netherlands. We talked about his work. He said that his research department in the government had discovered that to reduce speed of cars, and reduce accidents, they cobbled the road and made it narrower, and allowed pedestrians to mix with the traffic. Funnily, some years later, I am living in Spain where my local town has just such roads. When a vehicle approaches, pedestrians let it pass then continue walking in the narrow road. In the tree years I have been here there has never been an accident. On the subject of helmets, I once spoke with a medical person who said that the helmet saved the head but moved the injury to the neck. He was, though, speaking of motorcycle accidents. Cobbles are not good for cycling. If I had to cycle on cobblestones on a regular basis I would certainly wear a helmet. When my commute did involve a short section with cobblestones I found that while cars might be slowed down to 30 I was slowed down to 15 and they still crowded me to get past, only now I was far more uncertain of my ability to maintain a straight line. The issue I have is with the judiciary and legal profession and the insurers who will do their damnedest to show contributory negligence in any court case where the injured cyclist is seeking damages if the rider was not wearing a helmet (or hi-vis). The messaging about cyclists’ safety and helmet and hi-vis wearing emanating from the Road Safety Authority and Garda does nothing to allay my fears over this issue.